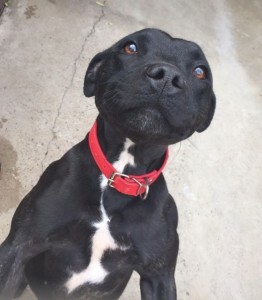 Evie is a very sweet small sized Staffy (possibly cross Patterdale?) who is around 3 yrs old. She is a pleasure to care for her at our rescue centre and is very friendly with everyone she meets. Evie walks well on the lead and really enjoys her walks, so an active home would suit her. She has been fine around other dogs, and could potentially live with a confident cat who will stand up to being chased sometimes by a playful dog! Evie would suit a home where she isn’t left for long periods, she may cry when alone at night when settling in. She will have a few accidents in the house as she settles, but will soon pick up a new routine in a home. She travels well in the car. Evie is a little cracker and will make an ideal family dog!